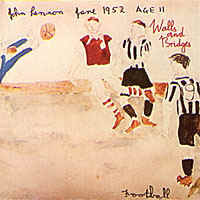 "Walls and Bridges" was John Lennon's last album of new material until "Double Fantasy" six years later. It was made while he and Yoko were separated during the now infamous "lost weekend" that lasted 18 months. It was released Sept. 26, 1974 (US) and Oct. 4, 1974 (UK).